이 삼존상은 흥국사 대웅전의 주존불로 모셔져 있는데, 협시 보살상의 보관 뒷면에는 각각 자씨보살대명숭정(慈氏菩薩大明崇禎), 제화보살대명숭정(提花菩薩大明崇禎)이라는 명문이 타출기법으로 새겨져 있다. 따라서 이 삼존상이 수기삼존상(授記三尊像)으로 17세기 전반의 숭정연간(1628~1644)에 조성된 것으로 알 수 있다. 이 삼존상은 조각수법이 매우 뛰어나서 양감이 잘 표현되었으며, 손과 발의 표정이 잘 살아있고, 옷 주름이나 장신구의 표현도 유려하다. 불상은 17세기 조각의 단순함을 잘 반영하고 있고, 두 보살상은 자연스러운 자세와 장대한 신체비례를 보여준다. 17세기 전반의 상으로 이와 같은 크기의 보살상을 동반한 삼존불이 드물고, 도상과 양식면에서도 조선후기 불교조각을 대표하는 상으로 평가된다. 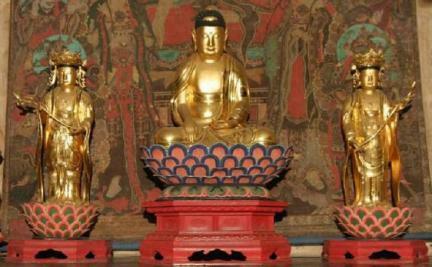 As the principal Buddha in Daeungjeon Hall of Heungguksa Temple, this Sakyamuni Triad is comprised of Sakyamuni and two attendant Bodhisattvas, Maitreya and Dipamkara. The Bodhisattva figures have embossed inscriptions on the back of their crowns, which mean “Maitreya, Chongzhen Era of Great Ming” and “Dipamkara, Chongzhen Era of Great Ming,” respectively. Hence it is known the Buddha triad, symbolic of assuring enlightenment, was made during the reign of Chongzhen Emperor (r. 1628-1644) of the Ming Dynasty. Sculpted with great skill, the images have a good sense of volume, with the hands and feet naturally depicted and the folds in the robes and the accessories gorgeously expressed. The Buddha image well represents the simplicity of 17th-century Buddhist sculpture, while the two Bodhisattvas show natural postures and majestic physical proportions. As there are few other Sakyamuni triads of comparable scale and stylistic refinement dated to the early 17th century, these figures are considered representative of Buddhist sculpture of late Joseon in terms of iconography and sculpting style.